It’s the season of deciduous trees with showy spring blooms. Plums, cherries & dogwoods are celebrated for the beauty of their flowers. Crabapples, unfortunately, are “second-class citizens.” They shouldn’t be: they also have beautiful spring blooms, and many newer cultivars (cultivated varieties, grown from cuttings rather than seeds) are disease-resistant. Here in the Pacific Northwest, these modern forms are much healthier than flowering cherries & plums. 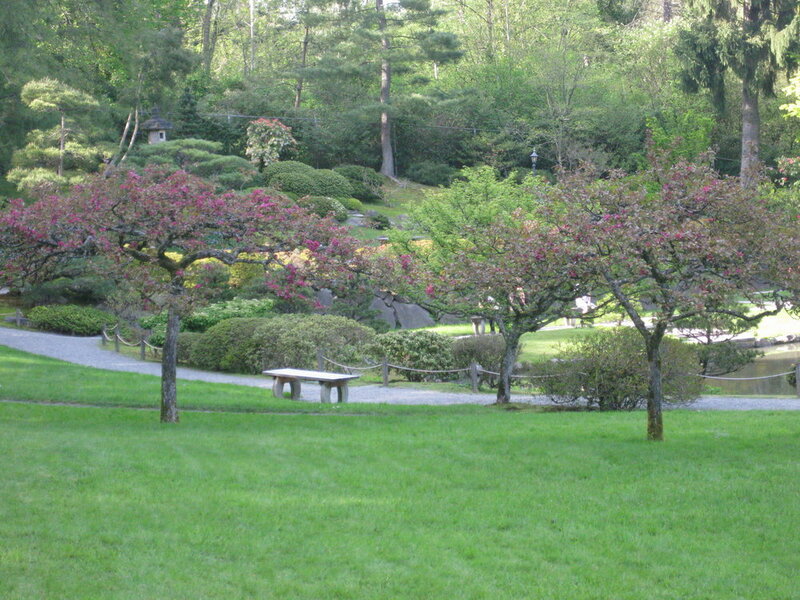 In addition to its seven flowering cherries, the orchard area of the Seattle Japanese Garden includes four crabapples (Malus ‘McBride’ and Malus x purpurea ‘Lemoinei’). Flowering cherries are iconic cultural symbols in Japan, but the presence of crabapples in the orchard indicates that they too have a long history there. Many species are native to Japan, and crabapple species & cultivars have traditionally been popular choices for planting in gardens, in pots, and as bonsai. Their flowering branches are used even today in the traditional flower arrangements known as ikebana. Perhaps more importantly, their flowers & form have long been represented in Japanese art and celebrated in its literature and poetry. 1883 Woodblock Print, “Crabapples and Peafowls,” by Kono Bairei (1844-1895), National Diet Library of Japan. Malus is one genus in the large and well-known rose family, Rosaceae. Known for showy flowers and edible or attractive fruits, Malus is unfortunately prone to various diseases. It includes modern apple trees, grown for their large edible fruits, as well as crabapples (also known as wild apples, crab trees and crabs). The difference between the two seems rather arbitrary. A tree with fruit smaller than two inches is a crabapple; otherwise it’s an apple. Both are considered edible, but crabapple fruits are typically sour or bitter. The Old English word crabbe, in fact, means “bitter or sharp-tasting.” In the words of Henry David Thoreau, crabapples are "sour enough to set a squirrel's teeth on edge and make a jay scream." The history of the genus Malus begins with a crabapple, Malus sieversii, native to the Tien Shan mountains of Central Asia – probably what is now Kazakhstan – between 4,000 and 10,000 years ago. Growing in temperate areas of the northern hemisphere, crabapples provided the original genetic material from which the large, edible apple was developed. Apples spread more quickly throughout the world, but crabapples do have a long history in Asian gardens. They were absent in Western gardens, however, until the 18th century, and the cultivars developed there were prone to diseases. Later, in the 20th century, Western hybridizers focused on creating crabapples with superior disease-resistance. Crabapples are tough and adaptable. They grow and flower best in full sun -- in moist, fertile, well-drained, slightly acid soil. Many are hardy to USDA Zone 4 (minimum temperature -30 degrees F.). When established, however, they’re drought-tolerant and low-maintenance, requiring less pruning than apples and most other fruiting trees. They’re adaptable to poor and/or compacted soils, and are tolerant of drought, pollution, wounding, heavy pruning, and stressful urban conditions. Newer cultivars, the result of innumerable crosses and backcrosses, have been bred to be resistant to the four main diseases that plague older forms: apple scab, cedar-apple rust, powdery mildew and fireblight. Crabapples bloom in April or May, with flowers that are white, pink or red. They develop from showy, darker-colored buds. Flower forms are classified as single (5 petals), semi-double (6-10 petals) or double (more than 10 petals). Singles usually bloom earlier than the other forms. Bloom time and duration are also affected by the weather. The leaves of most crabapples are held alternately on the stem, and are green to dark green, 2-4 inches long, and oval with toothed edges. Some cultivars or varieties open with purple tones or become bronzed during the heat of summer, and some have attractive yellow, orange, red or purple fall color. Twigs are green to reddish-brown or brown in color; as they mature, the branches begin to droop. The smooth, grayish-brown young bark becomes scaly and cracked or mottled with age. Crabapple fruits are round and less than 2 inches across, but most are much smaller (¼ to ¾ inch), and are held in dense clusters. Botanically known as pomes, they are yellow, orange or red. They mature in September or October, and are attractive to birds and mammals. The fruits of some cultivars are “persistent” – held on the tree in fall or even throughout the winter. Like many deciduous trees, crabapples tend to alternate between years of heavy flowering & fruiting and years of moderate flower & fruit production. However, considerable variation exists: the alternating pattern of some varieties is much less pronounced. As a garden designer, I often recommended modern crabapples to clients looking for a small (under 25 feet at maturity), easy-to-grow flowering tree. With their showy flowers, attractive disease-free foliage, and small ornamental fruits, crabapples are multi-season trees. There are many superior cultivars to choose from, most with tags that list their disease-resistance ratings. For example, Malus ‘Adirondack’ has “excellent” resistance to scab, rust, mildew and fireblight, and is widely available at local retail nurseries. The crabapples in our Seattle Japanese Garden are older, less disease-resistant cultivars, but their flowers are equally attractive. Each spring, I look forward to their elegant display.